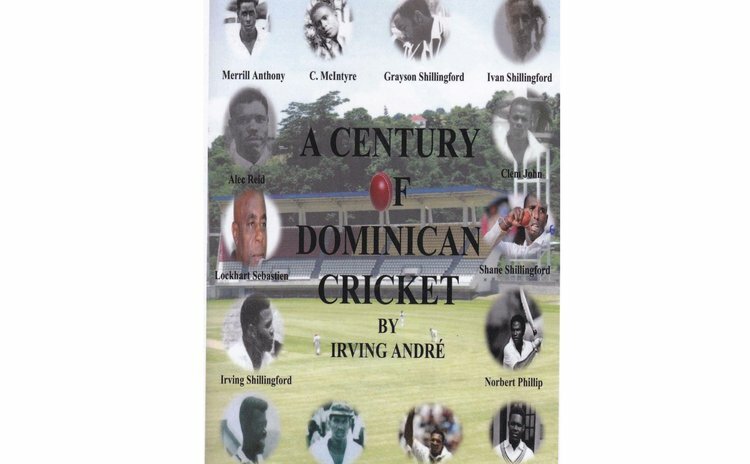 A big thank you for " A Century of Dominican cricket"
Cover of the book "A Century of Dominican Cricket"
At long last the one hundred years of Dominica's cricket history has come to light. In this regard I must say many, many thanks to Dr. Irving Andre for researching and bringing to light in book form the one hundred years of this great game as it was played in Dominica. It would be remiss of me as one who, for a very long time, was asking for such a task to be undertaken by someone with the ability to do so, if I did not express my sincere thanks and that of many cricket lovers in Dominica to Dr. Andre for taking on this huge task and to publish 'A Century of Dominican Cricket' which brings out all the great performances of players over those many years. The publication of this book is undoubtedly a most happy occasion for me and for many others who have served the game in so many different ways over the years. I am indeed very happy to have been a recipient of a copy of this book. Dr. Andre may not realise it but the publication of this book is equivalent to scoring a double or triple century or taking ten wickets in a match for Dominica. I am fully aware that Dr. Andre has undertaken a lot of research to produce this book. I am also very happy to have made my contribution during the production of Dr. Andre's work. Having read a number of books over the years, this book is very notable by any standard. The list of names of a century of cricketers is also very long and impressive. There are names like Merril Anthony, Cuthbert McIntyre, Ivan Shillingford, Grayson Shillingford, Irving Shillingford, Shane Shillingford, Norbert Phillip, Lockhart Sebastien, Keleb Laurent, Augustus Gregoire, Adam Sanford, Val Felix. Also there are warm appreciations to those who brought the game to life on pages of newspapers and magazines, behind the microphone or standing behind the stumps. My hope is that a copy of this book will be found on the book shelves of all lovers of this great game. Once again I want to congratulate you, Dr. Andre, for the hard work you put into the publication of this book. For me this is a dream come true.